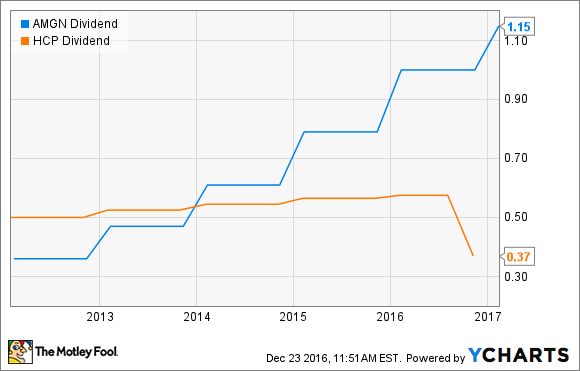 2 Healthcare Stocks With Better Dividends Than HCP, Inc. 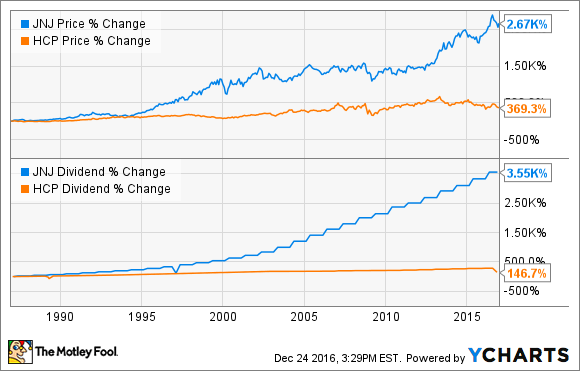 The healthcare REIT offers a juicy yield now, but you'll probably earn more over the long run with these two stocks. Healthcare investors seeking steadily growing income have probably noticed that HCP, Inc.'s (NYSE:HCP) dividend isn't quite as impressive after the recent spinoff of Quality Care Properties, Inc. spinoff. The healthcare-focused real estate investment trust still offers a juicy yield, but the shares of certain companies poised to generate increasing profits could generate far more income over the long run. Here's why Amgen (NASDAQ:AMGN) and Johnson & Johnson (NYSE:JNJ) are better income plays for healthcare investors. At recent prices, HCP, Inc.'s $0.37 quarterly payment offers a 5% forward yield, which is higher than J&J and Amgen offer right now. Those who take the long view, though, know that choosing a stock based on its yield alone isn't the best strategy. During the five years leading up to the recent spinoff, HCP raised its payout at a paltry annual rate of 3.68%. Let's look at why you can reasonably expect the dividends of these two healthcare stocks to rise much faster. California-based blue-chip biotech Amgen recently treated its investors to a 15% raise, hiking its quarterly payout to $1.15 per share for shareholders of record as of Feb. 15, 2017. At recent prices, that's a forward yield of about 3.1%, which you can reasonably expect to rise much higher than HCP's distribution in the years ahead. Amgen's latest payout hike is actually a bit smaller than Amgen investors have grown to expect since it began paying a dividend in 2011. The latest raise represents an annual growth rate of 26.15% over the past five years. If Amgen continues to raise its payout at this pace, then you'll see a 10% yield on your initial investment in 2021. At HCP, Inc.'s pre-spinoff five-year growth rate, meanwhile, you wouldn't see a double-digit yield on your original investment until 2035. AMGN dividend data by YCharts. Looking at the business, sales of Amgen's top product, Enbrel, are sputtering, but strong sales from other drugs have kept the company's dividend payout ratio at a comfortable 37.5% over the past 12 months. Third-quarter sales of osteoporosis treatment Prolia and calcium-lowering drug Sensipar both rose 18% over the same period last year. Further ahead, cardiovascular outcome data for Repatha could persuade insurers that the drug's benefits outweigh its $14,000 annual expense for millions of patients who can't control their cholesterol with cheaper statins. Success for this already-approved therapy would go a long way toward maintaining double-digit payout raises for many years to come. If you're a bit more concerned with long-term stability but would prefer a faster pace of dividend growth than HCP is known for, then consider the world's largest healthcare company. A leading global medical-device segment and a stable of iconic consumer brands that span generations still combine for over half of Johnson & Johnson's total revenue. Its faster-growing biopharmaceutical segment, though, has helped the conglomerate to report adjusted earnings growth for 32 consecutive years. If you appreciate peace of mind, then you'll love Johnson & Johnson's 54-year track record of consecutive annual dividend increases. During the 31 years that HCP, Inc. maintained its annual payment raises ahead of the recent spinoff, J&J has left HCP in the dust in terms of both dividend raises and share price performance. At recent prices, J&J shares offer a 2.8% yield, which is less than HCP's right now. However, a cozy 41.6% payout ratio and a stable of blockbuster drugs with surging sales growth suggest that you'll see a much better yield on your initial investment during your retirement years. Helping J&J make those payments is Imbruvica, which recently became the first chemo-free treatment option for newly diagnosed patients with the most common form of leukemia. Sales of the drug nearly doubled to $905 million during the first nine months of 2016, and it's expected to generate more than $6 billion annually at its peak. Earlier than many of its peers, J&J realized that investing its immense capital resources beyond its own laboratories offers superior returns. This helps explain how its clinical-stage pipeline boasts more than 30 ongoing late-stage trials that could lead to a steady stream of successful drug launches and a satisfying pace of dividend raises for many years to come.